A dakini (Sanskrit: ḍākinī; Tibetan:khandroma meaning "Sky dancer/walker") is a tantric deity that might best be described as a female embodiment of enlightened energy. Although dakini figures appear in Hinduism and in the Bön tradition, dakinis are particularly prevalent in Vajrayana Buddhism, especially Tibetan Buddhism, where they are of volatile or wrathful temperament. Dakinis are energetic beings in female form, evocative of the movement of energy in space. In this context, the sky or space indicates Sunyata, the insubstantiality of all phenomena, which is, at the same time, the pure potentiality for all possible manifestations. Additionally, they act somewhat as a muse (or inspirational thoughtform) for spiritual practice. Dakinis, being associated with energy in all its functions, are linked with the revelation of the Anuttara Yoga Tantras or Higher Tantras, which represent the path of transformation. Here, the energy of negative emotions, or kleshas, called poisons, are transformed into the luminous energy of enlightened awareness or gnosis (jnana) yielding rigpa (non-dual awareness). The worship of Dakinis originated in India between the tenth and twelfth century. It evolved from the Chakrasamvara sadhana, where Vajrayogini appears as his yab-yum consort, to become a stand-alone practice of anuttarayoga tantra in its own right. Eventually, the belief in Dakinis was transmitted to Tibet along with many Sanskrit Buddhist scriptures that were translated into Tibetan. According to tradition, it is said that a Dakini gave a black hat to the third Karmapa, Rangjung Dorje (1284-1339), when he was three years old. The Black Crown became the emblem of the oldest reincarnating Tibetan lineage. Judith Simmer-Brown, based on teachings she received from Tibetan lamas, identifies four main classes of dakini, which follow the Twilight Language tradition of esotericism in referrring to secret, inner, outer and outer-outer classes of dakinis. The secret class of dakini is Prajnaparamita (Tibetan yum chenmo) or voidness, the empty nature of reality according to Mahayana doctrine. The inner class of dakini is the dakini of the mandala, a meditational deity (Tibetan:yidam) and fully-enlightened Buddha who helps the practitioner recognise their own Buddhahood. 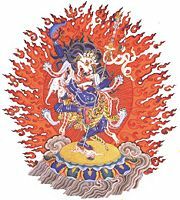 The outer dakini is the physical form of the dakini, attained through Completion Stage Tantra practices such as the Six Yogas of Naropa that work with the subtle winds of the subtle body so that the practitioner's body is compatible with an enlightened mind. The outer-outer dakini is a dakini in human form. She is a yogini, or Tantric practitioner in her own right but may also be a karmamudra, or consort, of a yogi or mahasiddha. Dakinis can also be classified according to the Trikaya: In this system, one can distinguish the dharmakaya dakini, which is Samantabhadri, representing the dharmadhatu where all phenomena appear; the sambhogakaya dakinis, which are the figures used for practice; the nirmanakaya dakinis, which are the women born with special potentialities, these are realized women, the consorts of the gurus, or even all women in general as they may be classified into the five Buddha-families. When considered as a stage on the Vajrayana Path, the dakini is the last of the stages: the first is the guru, which corresponds to the initial realization of the true condition of reality, as this is introduced by the guru in the empowerment, if the disciple obtains what the Inner Tantras call peyi yeshe (dpe yi ye shes); the second is the devata, which corresponds to the Contemplation insofar as the devata is the method we use for developing the state discovered in the initial realization of the true condition of reality; the third and last is the dakini insofar as the dakini is the source of the activities of realization. 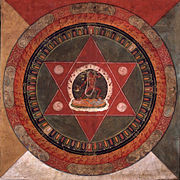 Painted nineteenth century Tibetan mandala of the Naropa tradition, Vajrayogini stands in the center of two crossed red triangles, Rubin Museum of Art. Vajrayogini or Vajravarahi (Tibetan: Dorje Naljorma, English: the Vajra yogini) is a dakini a associated with triumph over ignorance as well as with abandonment. Vajrayogini is key to the advanced sadhana of Chöd, which is visualized as the translucent, deep red form of a 16 year old female with the third eye of wisdom set vertically on her forehead. Vajrayogini's practice is said to be well-suited to those with strong desirous attachment, and to those living in the current "degenerate age." Her consort is Chakrasamvara, who is often depicted as a spear on Vajrayogini's shoulder. The seven-headed form of Vajrayogini is similar to the Hindu goddess Chinnamasta. Vajrayogini is the yidam that a meditator identifies with when practicing Six yogas of Naropa. Nãrodãkinĩ (Patan, Nepal), last decade of twentieth century, Paubhã, detail. The Dakini Nãrodãkinĩ is readily recognizable by her lunging posture and raised skull bowl (kapala). Her head is uptilted, poised to imbibe the blood that overflows her skull bowl, and her right hand brandishes a curved knife (kartika). Nãrodãkinĩ's physical attributes are interpreted with reference to long-standing Buddhist principles as well as distinctively Tantric concepts. For example, her freely flowing hair is in the lndic setting a mark of a yogic practitioner, especially one who cultivates psychic heat, whereas Buddhist exegetes imerpret the unbound tresses as a sign that her mind, free from grasping, is a flowing stream of nonconceptuality. Her crown of five skulls represents her transformation of the five aspects of selfhood into the five transcendental insights of a Buddha. Her garland of fifty severed heads symbolizes her purification of the fifty primary units of language and thought. Her bone ornaments represent five of the six perfections of a bodhisattva. Her body itself represents the sixth perfection, transcendent wisdom (prajna), which all female deities implicitly personify. Nãrodãkinĩ carries a mystical Staff (khatvãnga), supported by her left arm or balanced across her left shoulder. The staff indicates that she is not celibate and has immigrated eroticism into her spiritual path, mastering the art of transmuting pleasure into transcendent bliss. Simhamukha (meaning Lion-Faced Dakini) is regarded as one of the principal fierce manifestations of Padmasambhava, the eighth century Mahasiddha who was a founder of the Nyingma or "Ancient School" of Tibetan Buddhism. As such, she is connected with many ceremonies of the Dzogchen tradition. 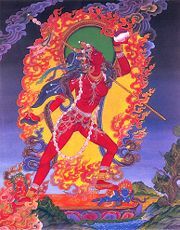 A fierce dakini, she is also one of the Phramenma, a group of female deities from the Bardo Thödol, or Tibetan Book of the Dead. When fully appreciating the benefits of this wrathful wisdom deity (according to the Nyingma tradition), she is the principal Dakini teacher of Padmasambhava. According to Campbell, "Iconographic representations tend to show the dakini as a young, naked figure in a dancing posture, often holding a skullcup (kapala) filled with menstrual blood or the elixir of life in one hand, and a curved knife (kartika) in the other. She may wear a garland of human skulls, with a trident staff leaning against her shoulder. Her hair is usually wild and hanging down her back, and her face often wrathful in expression, as she dances on top of a corpse, which represents her complete mastery over ego and ignorance." Iconographically, Vajrayogini, like most of the Dakini, is often signified with the investiture of Digambar. She is often pictured with a sow and is an important deity for tantric initiation, especially for new initiates. Simhamukha is iconographically represented as a wrathful deity who is usually depicted as a dark blue, or maroon, colored lion-faced female and is associated with the direction East. ↑ AAoArts, A portrait of the 3rd Karmapa Retrieved September 19, 2008. ↑ Simmer-Brown, Judith (2002). Dakini's Warm Breath:The Feminine Principle in Tibetan Buddhism. Boston and London: Shambhala Publications Inc., pp.69-79. ISBN 1-57062-920-X. ↑ Elias Capriles, Buddhism and Dzogchen (2003). ↑ Bernard, Elizabeth Anne (2000). Chinnamasta: The Aweful Buddhist and Hindu Tantric (Buddhist Tradition). Motilal Banarsidass. ISBN 978-8120817487. ↑ Robert Beer, The Encyclopedia of Tibetan Symbols and Motifs (1999), 23. ↑ Edward Conze, John F. Thornton, Susan Varenne, and Judith Simmer-Brown, Buddhist Wisdom: The Diamond Sutra and The Heart Sutra (2001). ↑ Dakpo Tashi Namgyal, The Dalai Lama, and Lobsang P. Lhalungpa, Mahamudra: The Moonlight—Quintessence of Mind and Meditation (2006), 88. ↑ Robert Beer, The Encyclopedia of Tibetan Symbols and Motifs(1999), 110. ↑ Robert Thurman and Huston Smith, The Tibetan Book of the Dead (1993), 163. ↑ Marion Woodman, Dancing in the Flames (1997), 43. ↑ Lama Yeshe, Jonathan Landaw, and Philip Glass, Introduction to Tantra: The Transformation of Desire (2001). ↑ June Campbell, Traveler in Space: In Search of the Female Identity in Tibetan Buddhism (George Braziller, ISBN 0-8076-1406-8), 138. Beyer, Stephen. 1973. The Cult of Tara: Magic and Ritual in Tibet. University of California Press. ISBN 0-520-02192-4. Campbell, June. 1996. Traveler in Space: In Search of the Female Identity in Tibetan Buddhism. George Braziller. ISBN 0-8076-1406-8. English, Elizabeth. 2002. Vajrayogini: Her Visualizations, Rituals, and Forms. Wisdom Publications. ISBN 0-86171-329-X. Gyatso, Geshe Kelsang. 1991. Guide to Dakini Land: The Highest Yoga Tantra Practice Buddha Vajrayogini. Tharpa Publications. ISBN 0-948006-18-8. Norbu, Thinley. 1981. Magic Dance: The Display of the Self Nature of the Five Wisdom Dakinis. Jewel Publishing House. ISBN 0-9607000-0-5. Padmasambhava, translated by Erik Pema Kunsang. 1999. Dakini Teachings. Rangjung Yeshe Publications. ISBN 962-7341-36-3. Simmer-Brown, Judith. 2001. Dakini's Warm Breath: The Feminine Principle in Tibetan Buddhism. Shambhala Publications. ISBN 1-57062-720-7. Yeshe, Lama. 2001. Introduction to Tantra: The Transformation of Desire. Wisdom Publications, revised edition. ISBN 0-86171-162-9. Vajrayogini website - website dedicated to Naro's Vajrayogini in the Gelug and Sakya traditions. The Great Bliss Queen - an in depth article on Vajrayogini. Vajravarahi entry on Yoniversum.nl - a short description. Red Vajravarahi on HimalayanArt.org - an image of Vajravarahi.